When I first came across a reference to Simon Costin’s notion to create the Museum of British Folklore, I knew it was a stroke of genius. So you can imagine my excitement when I walked over to visit him recently and his benign round face appeared behind the door, like the full moon emerging from a cloud. Leaving the East End street, I followed him down a dark passage wallpapered with trees into the basement kitchen where a lifesize wax figure sat across the table from me, while outside a fox gambolled placidly in the overgrown yard. Yet I was not in the least surprised by Simon’s living environment, since every element was perfectly in tune with his lyrical, visionary imagination. 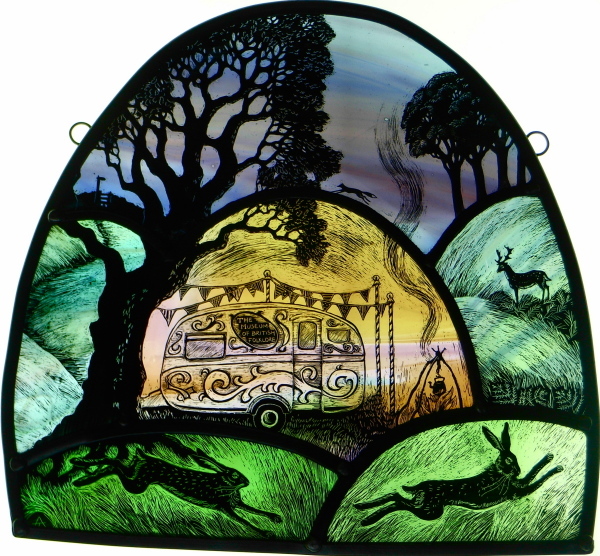 Growing up Devon, I was always captivated by the romance – Dare I say it? 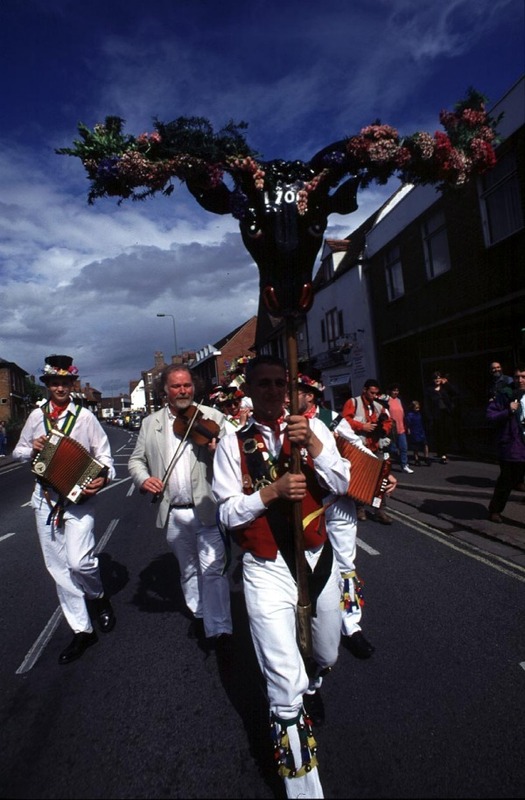 The magic – of the folk traditions (like the Ottery St Mary tar barrel rolling) that surrounded me. Experiences coloured by my mother’s reminiscences, recounted to me of her own childhood in Cornwall in the nineteen thirties, and the cherished moment in our family history when my grandfather as bank manager in Helston was chosen to lead the Floral Dance in and out the houses. Consequently, these inexplicable social rituals have always delighted and fascinated me with their egalitarian poetry. Mostly unsanctioned by the church or the state, they are the celebratory culture of the working people. “Is this your life’s work?” I asked Simon, broaching the burning question as soon as our conversation had settled down sufficiently for it not to be impertinent. And he broke into a wide emotional smile to reply with the answer I was hoping for, murmuring under his breath,“Yes.” Although Simon is a serious fellow with an distinguished career in design including five years as Alexander McQueen’s Art Director, he showed me the face of a child. Specifically, a boy who went on holidays to Cornwall and fell in love with a museum in St Ives that displayed Staffordshire Figures and Corn Dollies, awakening a lifelong passion for our vernacular culture. 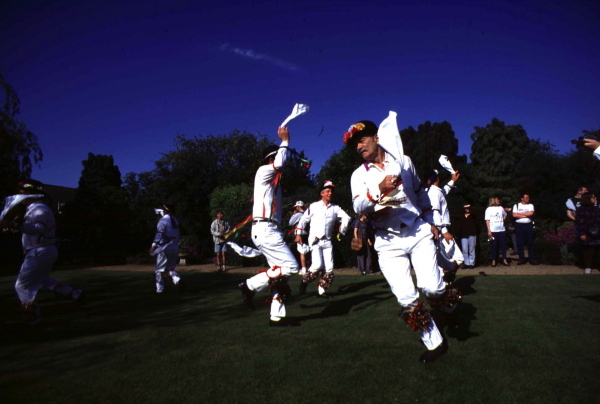 As an adult, delighting in the folkloric traditions and travelling the country to participate in many of these seasonal events, especially the Jack in the Green Festival in Hastings, Simon discovered that in spite of all the cultural imports – especially from America – which might appear to homogenise our country, the native culture is thriving. When Simon first attended the Jack in the Green Festival fifteen years ago, there were two thousand people but last year the crowd numbered over twenty thousand. And so, frustrated by the lack of any central focus to research and learn more about this culture, Simon was inspired to create the Museum of British Folklore with the purpose of celebrating and recording the indigenous culture of these Isles, and afford it the dignity it deserves. This was when his life changed. “I’ve always loved museums,” declared Simon, casting his eyes around his house, crowded with all manner of intriguing and charismatic curios, “primarily as repositories of knowledge. You can take what you will and interpret it how you please.” At first, he visited curators of existing museums with folklore collections to learn the lie of the land, but soon he realised he needed to create a presence at the festivals, as a means to hear the response from those in the fields and byways – “to learn the language of our intangible heritage,” as he put it. 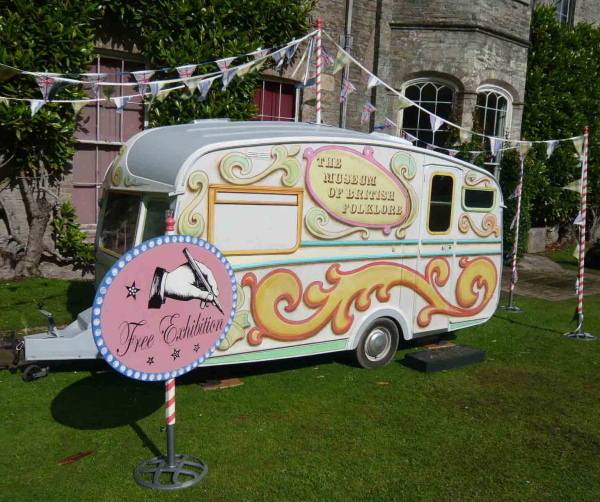 So Simon decided to set out touring the country in a caravan, and with the help of luminaries from the worlds of folklore and fashion, he spent six months planning an elaborate party for five hundred guests at Cecil Sharpe House to raise the funds. 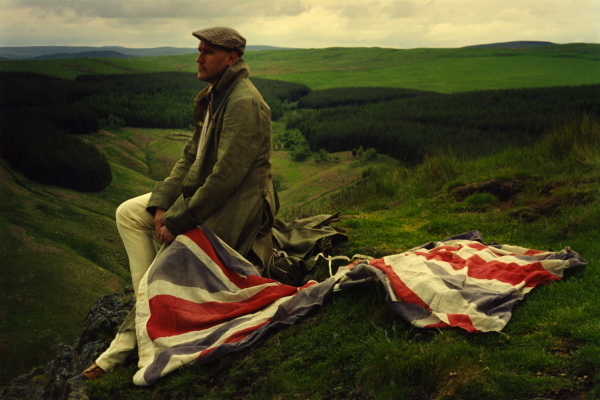 Then with his caravan painted with fairground scrolls and in an outfit consisting of a stove pipe hat designed by Stephen Jones and a long coat designed by Gareth Pugh, he set out from the East End on his eight month quest to meet the dyed-in-the-wool folkies of Britain. And the results of this exercise will be seen next year in a series of exhibitions, derived from Simon’s extraordinary discoveries upon his coast to coast trail. The first show to be unveiled will be the collection of Maurice Evans, an eighty year old who amassed thousands of fireworks since the age of twenty – all for the quality of the designs. He has donated his collection to the museum and this will be seen next year at Compton Verney, in the first ever exhibition devoted to the history of British fireworks. The second show will be in London, “Dark Britannica” staged in collaboration with the Museum of British Witchcraft in Boscastle, exploring effects of the repeal of the law against witchcraft in 1951 and the subsequent counterculture that arose when all the practising witches came out of the shadows, no longer fearing prosecution. Simon’s eyes glitter as he gets inspired reeling off these entrancing ideas, and outlining the plans that are afoot to find a building too. “The idea is to have two years of regional exhibitions and during that time we’re looking at sites,” he said, committed to establishing the museum outside London. “How do you manifest folk culture?” he asked rhetorically, proposing the central dilemma,“It’s the challenge with all these things, that’s why these events can be neglected, because there are no artifacts.” Simon’s solution is to involve the participants in these festivals working alongside visual artists and photographers, using his acute eye and experience as an Art Director to bring the language of contemporary art to the representation of these elusive phenomena. “We’re looking for material,” Simon announced to me, recklessly inviting contributions to the museum. 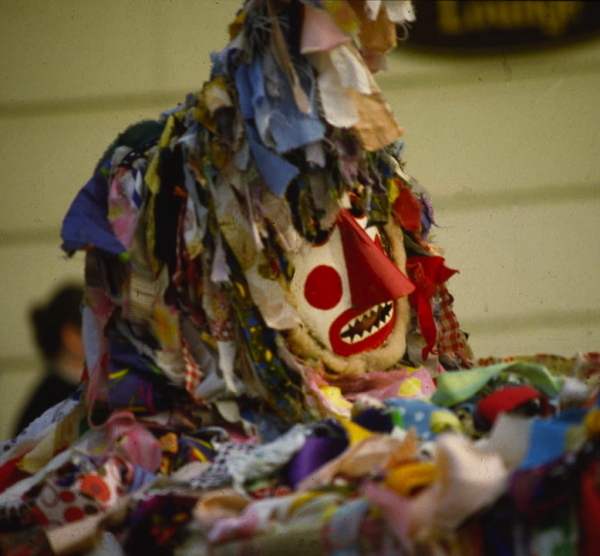 But this is such a huge subject – which has barely been tapped – that I think he will find himself inundated with wonders for inclusion in the Museum of British Folklore, though I guess that is exactly what he wants. 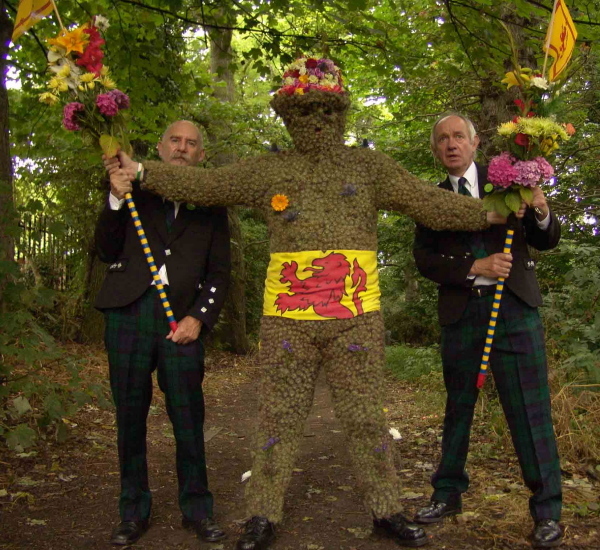 The Burry Man, Queensferry, second Friday of August. 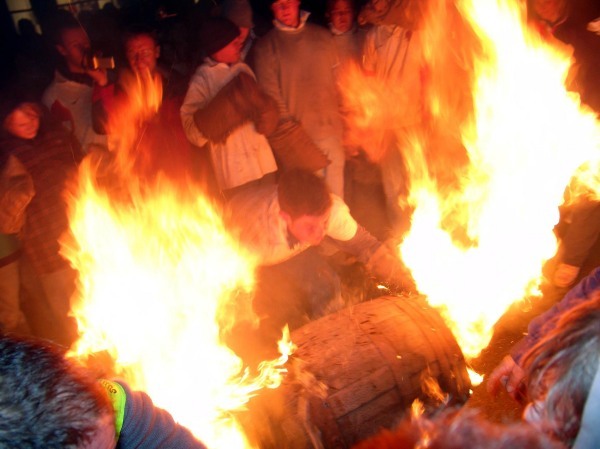 Barrel Burning, Ottery St. Mary, November 5th. The Museum of British Folklore on tour. 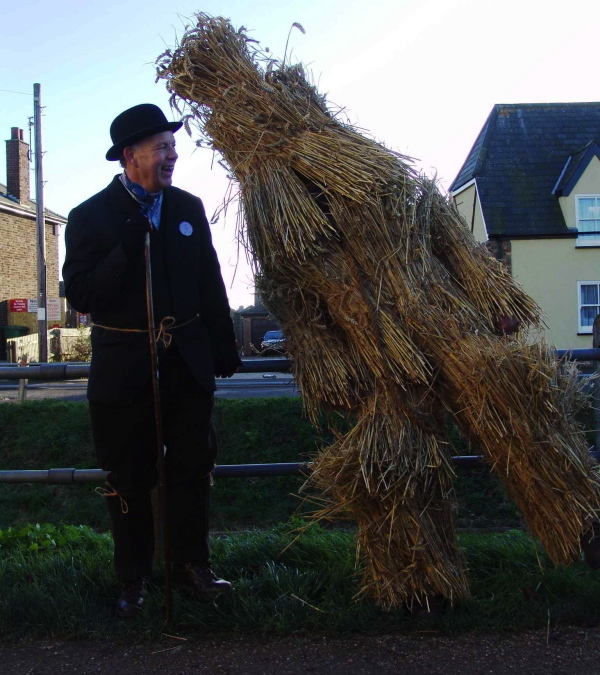 Whittlesea Straw Bear Festival, 14th – 16th January. As an American, I love our local traditions. 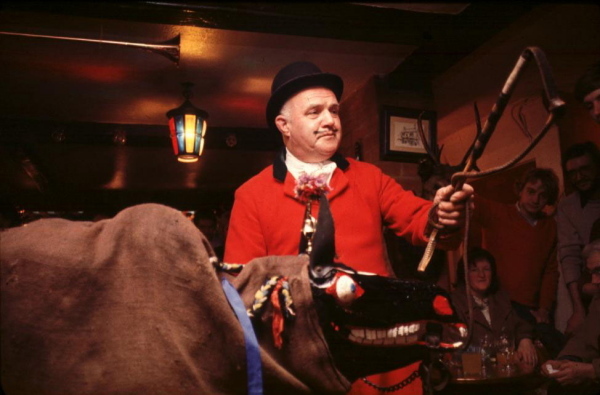 However, it is dismaying to see them so universally embraced to the detriment of local folklore. Discovering strange local superstitions and myths has become a small hobby. I’m sure that Simon has no trouble locating material, but I’ve found a source in such an unlikely place. It is reading old Angela Brazil novels. 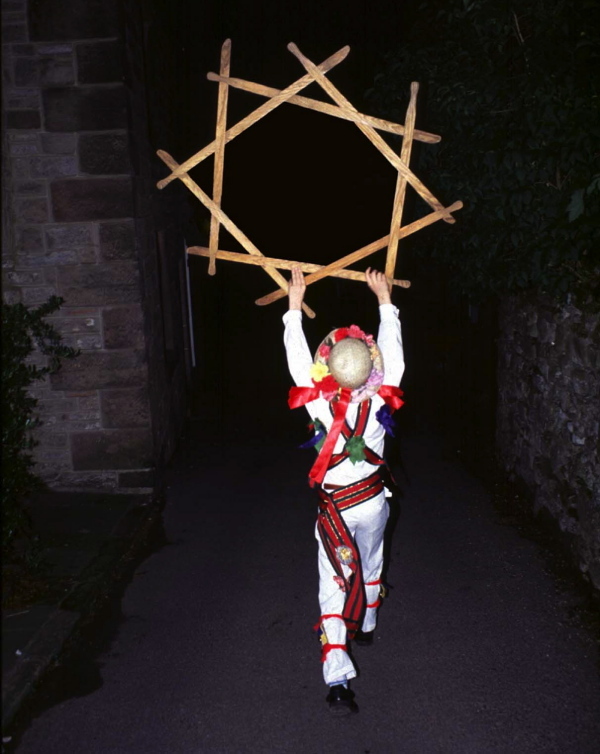 The schoolgirls often mention local folkloric traditions (and are occasionally punished for them!). All of these novels are on guttenberg, so you don’t even need to seek them out. This is where I learned about “curtseying to the moon” to discover true love. 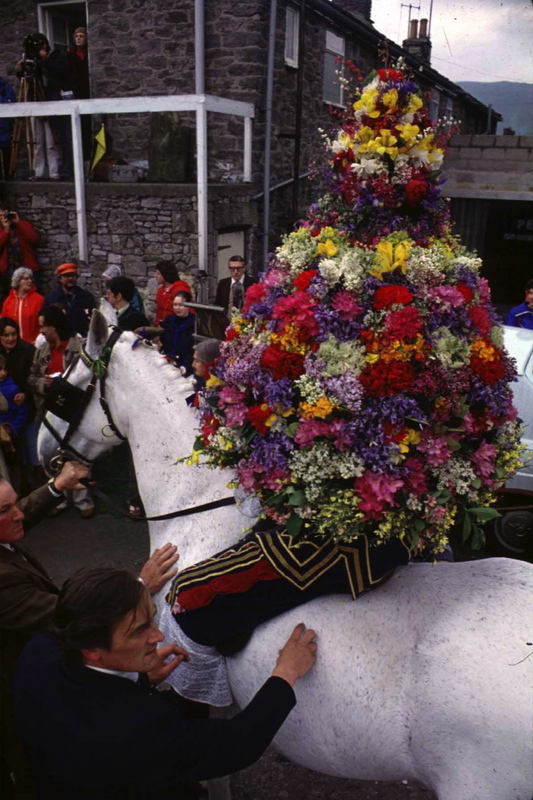 I’ve seen Morris Dancers and helped weave ribbons around a maypole, but I’d dearly love to witness some of these other traditions. Living near Pasadena, California where we have flower -covered floats in the Rose Parade every year, I especially enjoyed the flower arrangement on horseback at Castleton Garland Day. Absolutely stunning lead photograph, and the post, great – we have so, so much eccentricity and tradition to be proud about in the UK. Absolutely fantastic! Mr Costin is a hero, cannot wait for the firework exhibition. Thanks to the Gentle Author once again. Through a labyrinthine journey on the internet, I discovered your entry of November 24 about the British Museum of Folk Art. Meantime, I have been a subscriber, but seem to have missed this entry. My folk art interest centers around two locations – the southern United States, and Prince Edward Island, Canada. Each offers delightful exploration. Wish I could fly to London to see every one of the Museum’s forthcoming exhibitions. All good luck! I have Video footage of hundreds of hours of Folk Traditions and Morris Dancing Are you interested? Janet Whitham- i am defiantly interested if you would be so kind to lend some video footage? I’ve only just come across this wonderful piece of film having discovered Spitalfields Life only recently. Doc has some fantastic footage and other records of these and other customs but his archive is always short of cash – inevitably these days, such a precious resource gets no puiblic funding. If you can spare a few bob, details of how you can help and about Doc and his collection can be found here ~ http://www.docrowe.org.uk/. The Cutty Wren in Suffolk is one not to be missed!